Our cherry treat-inspired mocha combines our signature espresso, Mocha sauce and cherry flavored syrup. 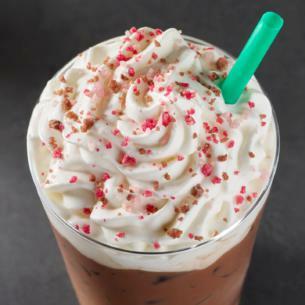 Topped with cocoa Valentine sprinkles, it's love at every sip. Ice, Milk, Mocha Sauce [Water, Sugar, Cocoa Processed With Alkali, Natural Flavor], Brewed Espresso, Cherry Syrup [Water, Sugar, Natural Flavor, Malic Acid, Potassium Sorbate], Whipped Cream [Cream (Cream, Mono And Diglycerides, Carageenan), Vanilla Syrup (Sugar, Water, Natural Flavors, Potassium Sorbate, Citric Acid)], Valentine's Sprinkle [Sugar, Cocoa (Processed With Alkali), Natural Flavor, Beet Juice Concentrate, Turmeric (For Color), Fruit And Vegetable Juice For Color (Apple, Cherry, Purple Sweet Potato, Radish)].